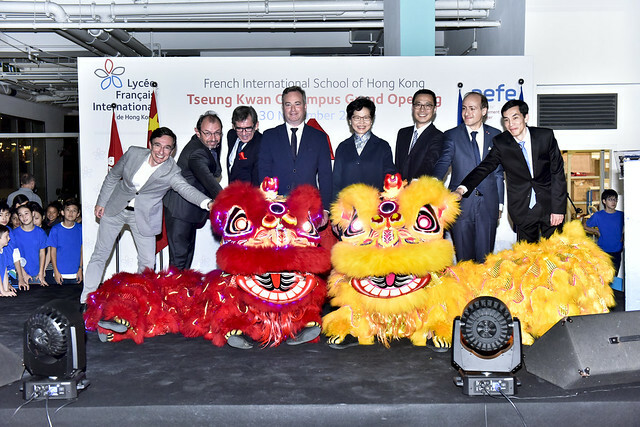 More than 2,000 students, parents and friends came together on Friday 30 November to celebrate the official opening of the Tseung Kwan O campus of the French International School of Hong Kong. It was an event that truly demonstrated the generosity and spirit of the FIS community! We were honoured to be joined by The Honourable Mrs Carrie Lam, Chief Executive of the Hong Kong Special Administrative Region, and Mr Jean-Baptiste Lemoyne, Minister of State attached to the Ministry for Europe and Foreign Affairs in France. The event was a showcase of creative and musical talent by students and teachers, culminating in a parade of three-metre high puppets designed and created by the students under the guidance of the artiste in residence, Fleur-Marie Fuentes. The evening Winter Extravaganza was made possible through the generous sponsorship of a large number of companies, including Moet Hennessy Diageo, Pernod Ricard, Club Med, Mind Beauty and St James’s Place Wealth Management. We were also delighted to welcome representatives from Credit Agricole, Veolia, Lucibel/Acolyte, Banque Transatlantique and Suez, whose substantial support helped to finance the building of the campus. Finally, we wish to thank the companies and individuals who donated or supported our Luxury Lucky Draw and our Student Activity Zones.